NORTHSIDE — Thwak! was the sound of finals at St. Boniface School in Northside for seven fifth- and sixth-grade students. Instead of pencil-scraping or keyboard-clicking, the exam room was filled with the crack of wooden boards splitting – as well as the occasional thud as a kick or chop landed awry, a board unbroken. Seated at a desk, Master Sun Park called instructions, followed by replies of “Yes, sir!” as family members watched from a corner of the gymnasium. The students had come in on a Saturday to test for their black belts in tae kwon do , one of the most popular martial arts in this country. If they passed, it would be a milestone not only in their martial arts training, but also in their academic lives. 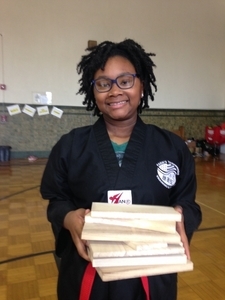 St. Boniface may be unique in the Cincinnati area for incorporating martial arts into its curriculum. Once a week, each St. Boniface pupil from kindergarten through eighth grade receives instruction in the Korean-originated martial art. Advancement from one color belt to the next is predicated on classroom behavior and grades as well as physical form. The brainchild of Sister Mary Ann Trotta, Sister Ann Gorman and others at the Catholic school, St. Boniface’s tae kwon do program is now in its sixth year. 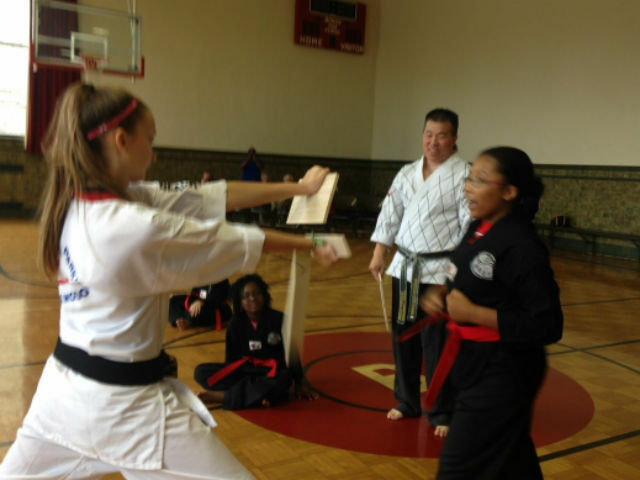 “There was a group of us on staff,” Sister Gorman explained, “who saw the need for children to be – all children, not just ours – to be more disciplined, more self-reliant, more respectful (and) all those tenets are part of tae kwon do. Gorman said between two-thirds and three-fourths of St. Boniface’s students come from single-parent homes; 94 percent of families are low-income. Gorman and Trotta, both Sisters of Mercy, researched different types of martial arts, deciding on tae kwon do because it could be adapted to be non-combative and nonphysical. “And so we went looking for a reputable program,” Gorman said. The search led them to Sun Park, who owns a tae kwon do studio in Loveland . At 52, Park is a fifth-degree black belt (there are nine levels), a winner of numerous championship titles and, by all appearances, a patient, respectful instructor. Initially, the program was funded through grants. It is now paid for by a benefactor who does not want her name published. The idea, he explained, is not to make them efficient fighters. “It’s to build their confidence, self-control, to make them a better person overall. The main point of the martial arts, the board breaking, is not so much about how hard they can hit but confidence level. When you have more self-control (you have) more respect for other people." Each of the students being tested had been taking tae kwon do at the school for at least three years. The exam gave students a chance to demonstrate they knew the important moves, techniques and combinations. And that they could break boards. If passed, the exam would make them first-degree black belts. At this level the belt is more an acknowledgement they’ve achieved a basic physical vocabulary than a statement of mastery. Among the six girls and one boy being tested was Arielle Barnes, 10, who admitted being nervous.